Tripp Lite 6in Mini DisplayPort to VGA / DVI / HDMI Adapter Converter mDP 6"
Tripp Lite's P137-06N-HDV allows you to convert your computer's Mini DisplayPort or Thunderbolt to a VGA, DVI, or HDMI monitor as an all-in-one, compact adapter. Ideal for Thunderbolt /Mini DisplayPort equipped laptops, Chromebooks, MacBooks and Microsoft Surface. Mac 10.11, Windows 10 Compatible. This passive, plug-and-play adapter requires no external power, drivers, or software, and supports video resolutions up to 1920 x 1200, or HD video resolutions up to 1920 x 1080 (1080p). Compatible with the Thunderbolt port on MAC computers such as MacBook Pro and MacBook Air. You won’t need to carry separate adapters for your laptop or tablet. 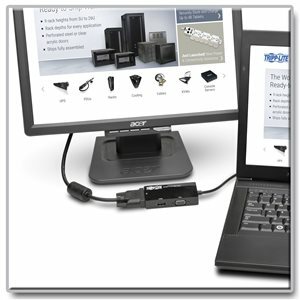 Tripp Lite’s 6-inch Mini DisplayPort to VGA/DVI/HDMI All-in-One Converter Adapter (M/3xF) allows you to connect the Mini DisplayPort or Thunderbolt™ port on your laptop or tablet to a VGA, DVI or HDMI monitor. It’s an easy all-in-one solution for displaying content on a larger screen. Only one display can be connected at a time. The P137-06N-HDV supports video resolutions up to 1920 x 1200 and HD video resolutions up to 1920 x 1080 (1080p). It also supports 36-bit Deep Color (12 bits per channel). The P137-06N-HDV is compatible with PCs and Macs equipped with a female Mini DisplayPort. The adapter’s Mini DisplayPort connector is also compatible with the Thunderbolt port found on newer Macs. The P137-06N-HDV requires no external power and is completely plug-and-play with no software or drivers to install. Note: When connecting a VGA monitor, the distance between the adapter/converter and monitor must be no longer than 10 ft. When connecting a DVI or HDMI monitor, the distance must be no longer than 6 ft. The P137-06N-HDV is a passive adapter that requires the connected computer to have a DP++ (DisplayPort++) port. This allows HDMI and DVI signals to be passed through. Check the documentation for your Mini DisplayPort source for compatibility. The P137-06N-HDV is manufactured using top-quality materials. With its small size and built-in cable, the P137-06N-HDV is perfect for travel and stowing in your laptop bag. This P137-06N-HDV comes backed by a three-year warranty and is manufactured in compliance with strict RoHS specifications, reflecting Tripp Lite’s commitment to environmental responsibility. Mini DisplayPort to VGA/DVI/HDMI All-in-One Converter Adapter, 6 in.